It's about time we saw some neons around here, don't you think? 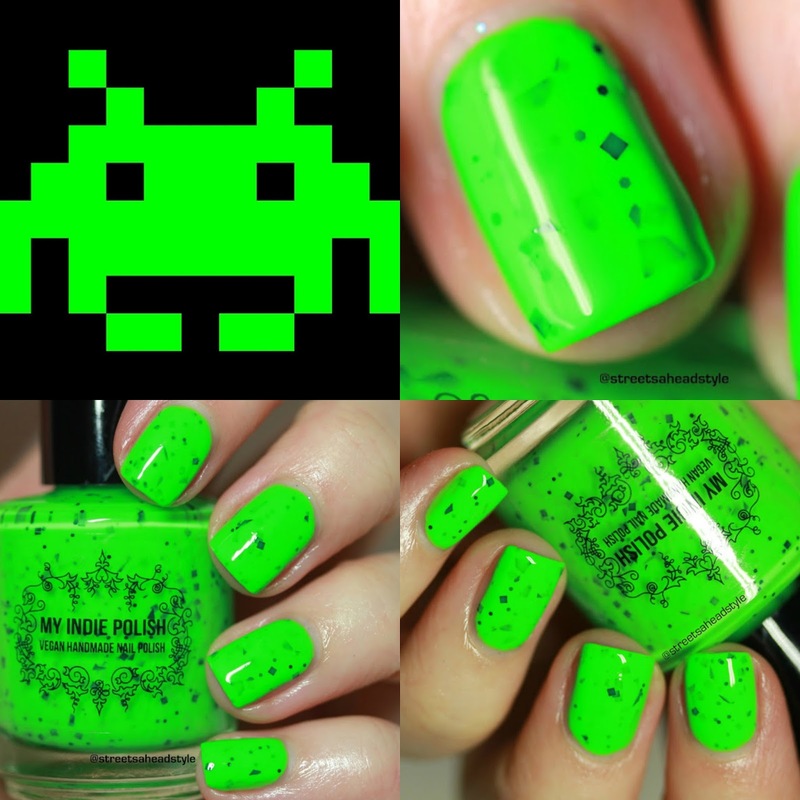 Well, for the April Polish Pickup, My Indie Polish has created an eye-searing neon green crelly inspired by Space Invaders! 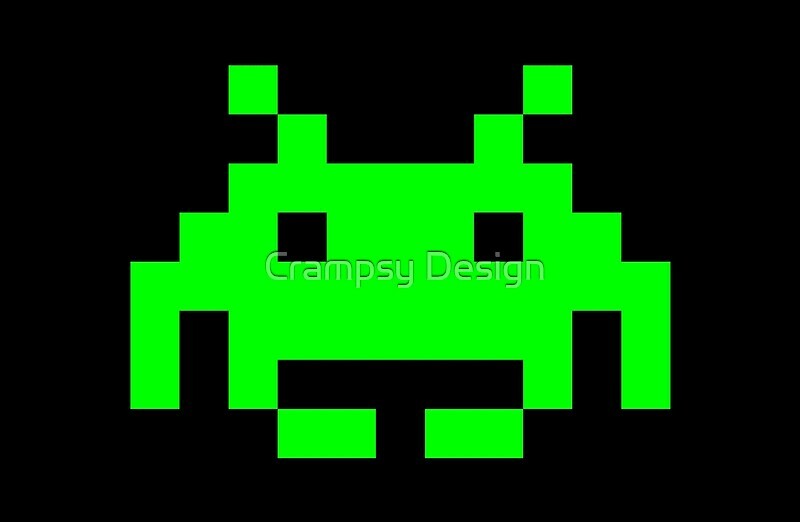 My Indie Polish Space Invaders ($12.50 USD, 15 mL) is a super bright neon green crelly with black glitters in various shapes and sizes dispersed throughout. The inspiration photo is below and I don't think this polish could have been any more perfect. The theme for the April Polish Pickup is Planets and Galaxies so My Indie Polish went with a space-themed old school arcade game. I just love it. NO CAP! I would say this is a two-coater but I used three coats for my photos. I did not have to fish or play around with the glitters to get them how you see them. They came out very easily on their own and lay super flat. This is a thicker crelly than My Indie Polish's usual crelly formula but it's perfect. I am wearing top coat which smoothed everything completely but I have said it before and I will say it again... My Indie Polish is the crelly master! Their base is wonderful and the glitters always lay flat even without top coat so much so that you could wear this without top coat if you wanted for a satin finish. Shop is live the first Friday, 11 AM EST (April 6, 2017), of each month and stays open for four days, through the following Monday (April 9, 2017) at Midnight EST. This is the ONLY time frame in which the monthly polishes will be available for purchase. All products are pre-ordered and will ship a minimum of 3 weeks after sale commencement. Polish Pickup ships for a flat fee of $3 in the US and $5 to Canada. International shipping is now available at cost. 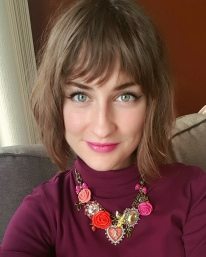 Polish Pickup will combine orders placed over the 4 day sale period. This will happen automatically when shipping begins and you will then receive your shipping overage refunds.